Student's should arrive no later than one hour before the check-in time closes of their individual event. There are several key tasks that occur before a tournament begins including checking in, equipment check and warm up time. What Should We Do When We Arrive at the Tournament? CHECK-IN TO THE TOURNAMENT: You need to check-in upon arrival to ensure that you are officially registered to compete. You should have your USA Fencing # (Physical card or online card) as well as a form of identification for the fencer. FIND THE COACHES: Find the TM-FC Coaches and/or other students from the club and bring your equipment to our "spot"/"home-base". This is where we will meet and keep our equipment within the competition venue. WARM UP: The kids need to WARM UP at for at least 40 minutes before the start of pools. Depending on the venue space, the coaches will lead a group warm up BUT warming up and being prepared is ultimately the kids responsibility. If coaches are working an earlier event then students should be prepared to run, stretch, do a bit of footwork and ideally fence electrically with their club-mates. Mindset #1: The students, coaches and parents at TM-FC are a team. The coaches do their best to get to as many matches a possible, we expect best efforts and spirit from the students and parents have an important role to play with logistics and support. Keep The Coaches In your "Eye-Site" and Informed: Competitions are hectic and sometimes the students are spread out across the space. We want to get to as many bouts as possible and in order to do this effectively we must work in tandem with our students and parents. Please, DO tell the coaches the strip # where your student is fencing once they are posted. During the match rounds, sSuch as pools or DEs), do not hesitate to waive or alert us if your child is fencing. (Sometimes texting when a child is on-desk is also helpful) If we are coaching at another strip, we may not be able to make it over or come over immediately, but as soon as a match ends, we will work to head over to your strip. Students Should Stay Focused and Alert: It is essential students pay attention to what is happening, especially between rounds so they do not miss their matches or show up unprepared to fence their best. Students need to be ready to compete both physically and mentally at all times. During pools, they should remain by their strip and during Direct Eliminations they should remain in their "Pod Area" to hear their match being called. Sometimes this is a tournament official calling out a name in a loud and crowded room. Students can be be in 4 places at a competition: 1. competing in a pool or DE or nearby the place where they are about to compete, 2. Staying near or around their teammates and coaches especially during the same event 3. Bathroom: Tell a coach or club-mate in your event if you need to go to the bathroom and it is near the time to compete. 4. the "team spot" in the venue. On the other side, students should NOT wander aimlessly or walk around the venue without purpose. 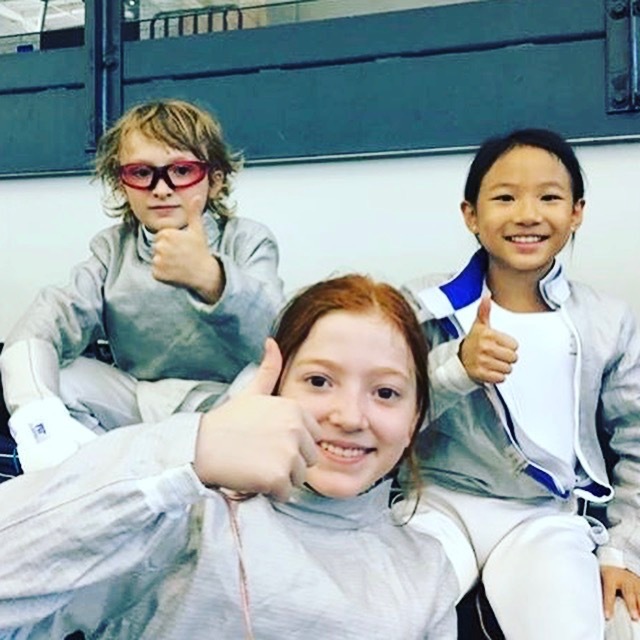 If Club-mates Fence Each Other: There is absolutely NO CHEERING, COACHING or anything when fencers from our club compete against each other. This includes parents, students and coaches. This will destroy club culture and it creates bad blood when it happens. If students from the club draw each other, everyone should stay away from the match and avoid even the perception of being involved. This is a non-negotiable. We are one team. Students from our club should "FENCING HUG" before and after the match. Regardless of the outcome. If Your Child is Eliminated Early: (Mindset: Learn and Study as much as possible). If a student doesn't make the finals (only 2 people make it from the entire field!) and is eliminated in an earlier round, they should gather their equipment and then go to cheer for any of their remaining club-mates in the tournament until everyone is eliminated. Fencing with/without a Strip Coach: (CHAMPION MINDSET) "Bouts are won/lost at practice". Students/parents should not feel as if they cannot win if they don't have a strip coach. 7. Only the Coaches should be Coaching or Addressing The Referees: Parents and club-mates can cheer (positively only) for their children and club-mates. They should not be giving coaching advice especially if a coach is there trying to communicate with the fencer who is competing. 8. What Can Parents do at a Tournament to Help? Make Sure your Child is drinking water and that they eat a healthy pre-tournament meal and that they have light snacks (Fruits and bars throughout the day to keep up their energy). Film the matches for analysis later. Keep them at the tournament after they are eliminated to watch and cheer for their teammates and watch the finals. Self-Talk: "I Have Everything I Need to Win": They've learned the moves at practice and overcoming challenges is part of what a champion does. Champions LOVE challenges. Make something more difficult for a champion and they won't complain or feel bad for themselves. A Champion will rise up again and again to meet setbacks and challenges. Champions Never Give Up! The people that win consistently will always fight and give their best effort even when things are not going their way in a bout. Even in the darkest moments, we expect our students to pull themselves together and push forward. Champions NEVER EVER give up. Champions Don't Make Excuses: This is particularly important to remember at tournaments for everyone. We own outcomes: win or lose. We have to own results if we want to be champions. Something will always be "wrong" and something unexpected will always happen at a tournament. Champions rapidly accept their circumstances "It is What It Is" so they can immediately go to what they can control. No Excuses! Excuses Are a Disease: Every time we make an excuse for why we've lost instead of owning responsibility, we move one step further away from being a Champion. If we lose, they Beat Us...Period. Give our opponents there due for beating us and come back strong next match. It is not that these things aren't valid if a bad call occurs, but Champions just find solutions and overcome. Will There Be Coaches From TM-FC Attending? TM-FC is a competitive club and as a result we send coaches to many competitions. In advance, our staff "designates" competitions where we will be sending the coaches. We generally attend every National competition (NAC) and the vast majority of RYC and SYC, RJCC and ROC competitions within Region 3. International competition coaching is on done directly with students who are attending those events. We generally do not send coaches to local club competitions. What Coaches Will Be There? We generally try to keep a 4-1 or 5-1 ratio of students-coaches. The coaches attending any event are subject to change. How Much Does Tournament Coaching Cost? Tournament coaching is included in our competitive programs. (Elite 1, 2 and 3). Please consult our "Terms of Service" for more information on how this works. Tournament coaching is mandatory if you represent TM-FC. If you are not on a competitive program, (i.e. The Beginner Program) you will be charged the "class Pack Rate" of $55 if you attend a tournament designated by the club.